Home Blog Why Learn German? Maybe you’re considering learning a new language. Maybe you’re even toying with the idea of German. There are many reasons to learn any foreign language. And you might be wondering why you should learn German, or how you would even start. The truth is that there are a bunch of reasons to learn German, and even if you live in the US, there are lots of ways to learn German. There are over 90 million native speakers of German globally. Additionally, if you’re living in the US, you might be surprised to know that German is an integral part of US history. There have been large numbers of German immigrants all throughout US history, and the influence of German culture was especially present during the formation of the 13 colonies. Aspects of German culture still remain in American society, so learning German is a great way to connect with US history! All of this is just barely scratching the surface, so let’s dig into the top 12 reasons to learn German. German is the second-most commonly spoken language in Europe, with over 90M native speakers and 100M people learning it as a second language. While German speakers are mainly located overseas, there are 1M German speakers in the US as well. Speaking German would allow you to communicate with people all over the world, which is beneficial in any profession. Whether you are dealing with sales prospects, current customers or colleagues, that’s a lot of reason to learn German. Not only are there 1M German speakers in the US, there are over 90M German speakers in Europe. Learning German will allow you to build an international professional network in countries such as Germany, Austria, Switzerland, and Luxembourg. Speaking multiple languages is always beneficial and looks great on a résumé. Globally, there are over 90M German speakers, and German is the official language of 6 countries, including Germany, Austria, Switzerland and Belgium. It is the second most spoken language in Europe, with approximately 13% of the population of the European Union fluent in German. Learning German would provide you with opportunities to connect with people all over the world in new and meaningful ways, whether it is for business benefits, increased travel opportunities, or just getting to know people from other cultures. Did we mention that German is spoken in 6 European countries? If you’re a student, speaking German means that you can study in a bunch of countries around the world. That’s a lot of different geographies, a bunch of culture, and a ton of frequent flier miles. It’s also a great way to differentiate yourself from an academic perspective. If you read the blurb above, all those opportunities apply to you if you’re already in the work force. Germany is the largest national economy in the EuropeanUnion, and has the fourth-largest GDP in the world. 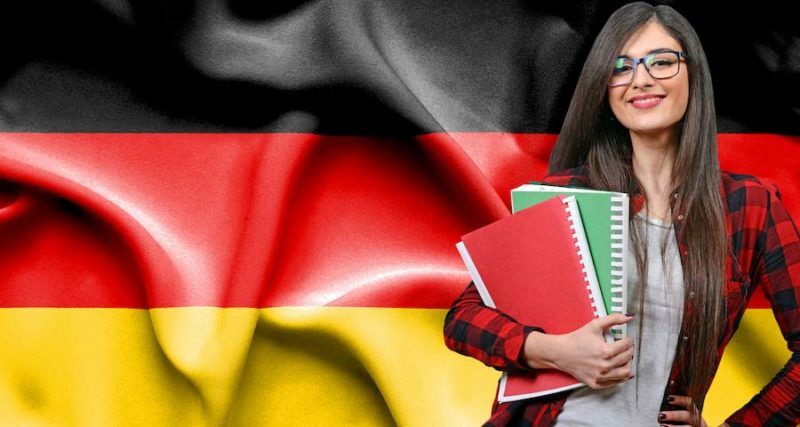 Learning German can give you a chance to work in an economically strong country with connections to many other countries in Europe and the rest of the world. Germany has a vibrant film and music industry, and speaking German will allow you to fully appreciate some of the excellent media that German-speaking countries produce. Rather than relying on subtitles and translations of German film, music and literature, you can experience German media in its original state! Language is the soul of a nation, and there are over 6 nations that count German as one of their official state languages. That’s a lot of culture to tap into, and a lot of opportunity to expand your horizons. Whether you’re looking to better understand new cultures, connect with local or international history or just looking for personal development and improvement, learning German is a great way to address all of those goals. Learning a new language is a cognitive function, and one that’s proven to keep your mind sharp. Did you know that clinical studies have shown that learning a new language can help you delay (or even avoid) ailments like Alzheimer’s or dementia? By the way, that goes for people of any age, so whether you’re a teenager, baby boomer or anyone in between, learning German is a great way to sharpen your mind. Lots of people chose to learn a new language in order to study or work abroad. Others study a new language in order to connect with friends, family or loved ones closer to home. There are over 1M German speakers in the US, and many more people begin to learn it each year. What better way to connect with people in your community than to learn a new language together? Over the course of US history, there have been millions of immigrants from German-speaking countries, and some of their culture still endures today. Many German immigrants were settlers in the thirteen colonies and are now largely assimilated into American culture. However, some cultural influences still remain, such as kindergartens, the tradition of Christmas trees, and originally German foods like hot dogs and hamburgers. By learning about the German language, you can connect with some important aspects of US history. French may be the language of romance, but love is blind to ethnicity or language. Even if you’ve only been skimming everything on this page, you’ve probably picked up on the fact that. There are more than 90m native German speakers, and 128M people speak German as a second language. We’ve all heard how hard it is to find a good partner, so why limit yourself even further? With just a few exceptions, English and German share a common alphabet, and around 80% of English words are of Germanic origin. Sentence structure and grammar are remarkably similar in both languages, so if you can already speak English, learning German should be pretty easy. More so, it’s a ton of fun. Have you read all the different reasons to learn German above? Travel opportunities, culture, German media, romance… that all sounds like a ton of fun!